Are there any close up pictures/diagrams available of the Main/fore/mizzen tops. I'm (trying !!) to build the Billing Vasa and can't seem to find any details. 1) How are the dead-eyes for the topmast fixed to the main top - just tied? 3) how is the bottom of the top mast fixed to the top of the main mast in real life - tied with ropes?, bolted? clamped? and is there some sort of stop below it to provide a bit more vertical support? I know there's a clamp to the head of the main mast, but surely in real life there would need to be something lower down as well? Hopefully you can understand what I mean. 1. The topmast deadeyes are not actually attached to the top, they are attached to the lower mast shrouds by puttocks, like chainplates. These consist of an iron hoop around the deadeye with a hook at the bottom, with a bight of rope over the hook led down through the top to the shrouds about 1.5 m below the top, where they are taken around a wooden bar lashed to the shrouds (see attached false-color render for how they are tied). At the top, the puttocks pass through the heavy rim of the top, where holes through the rim are reinforced with iron plates to minimize wear. 2. There is about 20 cm of space between the mainmast head and the lower end of the topmast, which leaves space for the lower shrouds, mast tackles and stay. At the upper end of the lower mast, there is a heavy wooden cap with an iron bail on the forward face. The topmast rests in a semi-circular cutout in the cap, and is held in place by the iron bail, which is fixed to the cap with two forelock bolts. 3. The lower end of the topmast is square in section and passes through the top and a rectangular opening framed by the trestletrees and the forward crosstree, which restrain the mast athwartships and fore-and-aft. The weight of the mast rests on a fid, a woodne or iron pin of rectangular section driven through a thwartships hole in the heel of the mast, projecting out from both sides. The fid rests on the trestletrees. To set the topmast, it is raised up through the rectangular hole (using the toprope until the fid hole is above the trestletrees, the fid is tapped into place, and the mast lowered onto the trestltrees. Once the shrouds are set up, the topmast cannot move up, down or sideways. Very many thanks - efficient as ever. By the way, did you get my message regarding potential use of DropBox for the plans? Sorry to be such a pain, but is there any chance of a diagram illustrating your description (3) concerning the meeting of the lower topmast with the upper mainmast. I am finding it very hard to relate this to the Billing diagram (such as it is), and your description is patently the definitive one. To avoid repetition, I assume the same schema will apply to Fore and Mizzen masts. As Fred says, the topmast rests on the trestle trees via a fid. If the fid was to be suddenly removed(-you really can't due to the load it's under, you need to lift the mast with the toprope), the topmast will come down through it's hole. The topmasts are meant to be movable parts of the rigging. For example, the topmasts might be struck at sea in a severe storm. 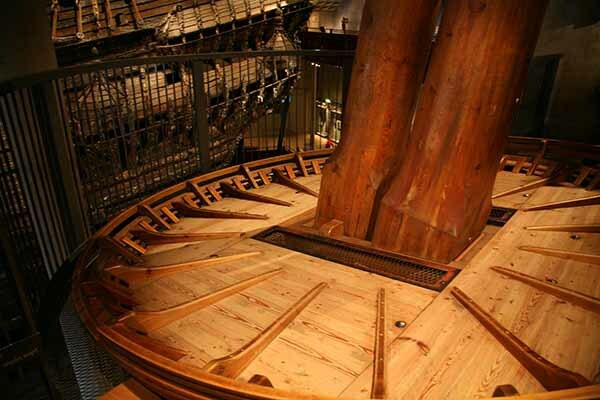 Here is a picture of the Vasa main top replica in the museum. The topmast is to the left. The fid is the small square peg at the bottom. I decided to rig the topropes on my model to show how they work. There's an eyebolt under the cap on each side. The toprope's end is on the starboard side eyebolt, runs through the trestle tree and then through a sheave in the heel of the topmast, then up to the cap on the port side where a block is attached. Through this and down to a sheave on the knights head aft of the mast. The main toprope is unfortunately a bit tricky here, as the relevant sheave is two decks down and requires some pre-planning before the hull is too closed up. Omitting the topropes entirely would be perfectly reasonable though, as they would most likely have been taken down once the topmast was set. While striking the topmasts would be one of the last things to do to lower top weight of the rigging in a storm and the ship may very well be at anchor, it is actually possible to set sail in this configuration. In the sevententh century, topropes were left rigged, since they were part of the running rigging and frequently used. English logbooks of the 1660s, for example, indicate that lowering the topmasts was a normal part of heavy-weather sailing, rather than a last resort, and that the topmasts might be set and doused several times in a day. In some cases, striking topmasts was a normal part of the anchoring or mooring process. By the 18th century, topmasts were more commonly left set and only struck in extremely heavy weather, so topropes were by then not often left rigged. As Peter points out, there is a lot of rope to coil and hang (in Vasa's case, over 25 m of rope over 50 mm in diameter), but this is not on the upper deck. The fall of the toprope passes down through the hatch in the upper deck abaft the mast, along with the main halliard, and then continues through a round hole in the upper gundeck in front of the halliard knight, to a sheave in the knight on the lower gundeck (See illustration). This allows the fall to be taken to the main capstan, which lies farther aft. In practice, the toprope only needs to be belayed when the mast is struck, since it does not carry a load when the topmast is set. When being set or struck, it is wrapped around the capstan. Stoppers might be clapped onto the toprope for the brief time it takes to ready the mast for striking after the fid has been removed or just before it is inserted, and stoppers could also be rigged once the mast was struck. When set, the excess line can be coiled up and hung on the knight (there is a small crossbar or cleat in it for this purpose), on the level of the lower gundeck and thus out of the way. Just as well, since it is a big coil! Peter's picture of the replica is as good an image of how the masts overlap as you can find. 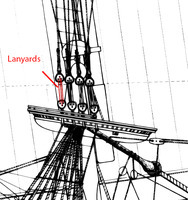 The topmast shrouds were tensioned in the same way as the lower shrouds, with lanyards rove through the deadeyes (see illustration). In practice, once the working tension was established, the topmast could be set and struck without having to touch the lanyards (we do this regularly on Kalmar Nyckel, a 17th-century replica I sail on). In setting, the toprope is used to lift the topmast until the fid hole is just slightly above the trestletrees so that the fid can be driven in, then let down onto the fid. There is just enough give in the shrouds and stays to allow this. Some topmasts on Dutch ships of the 17th century had a knob or lug on the heel (bottom end) which prevented the mast from being raised too high when setting. Do i understand that when lowered, the shrouds are without tension, and even completely loose? Yes, when the mast is struck, the shrouds are left alone, so that they hang down in big loops. We usually trice them up to keep them from flapping about. The heel of the topmast is also lashed to the lower mast. I find the diagrams you put up really helpful, as I'm sure many do. Is there any way of putting up a fuller set (obviously not, I guess, if they are previews of Vasa II), possibly using the Dropbox mechanism I've set up experimentally? The images I post here are ones that I make especially to answer specific questions from the forum members, and I am happy to make and post these, but it is a more efficient use of my time, and better for modellers in the long run, if I concentrate on getting Vasa II into print rather than simply dump images onto the net without context or commentary. I can post the 1980 model plans here as PDFs, since they will fit within the file size limits (in fact, I have already done so), but starting to dropbox lots of large images is not a good use of my time. 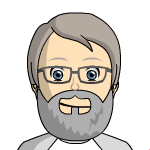 The resolution of the PDFs as posted here is appropriate to the level of detail in the model plans, so I do not think that we need to find lots of gigabytes of space elsewhere.